A jar of Crofter’s Organic Peach Passion jam. It's good, but it's not all that passion-fruity. Passion fruit isn’t the first thing that comes to mind when I think of jam from Canada. Raspberry, yes. Ditto for strawberry, blackberry, blueberry and peach. Those are the grocery store standards. If you’re lucky, maybe some homemade crabapple jelly from your creative neighbour’s fall canning marathon. But passion fruit? Why, that’s about as Canadian a fruit as pineapple. 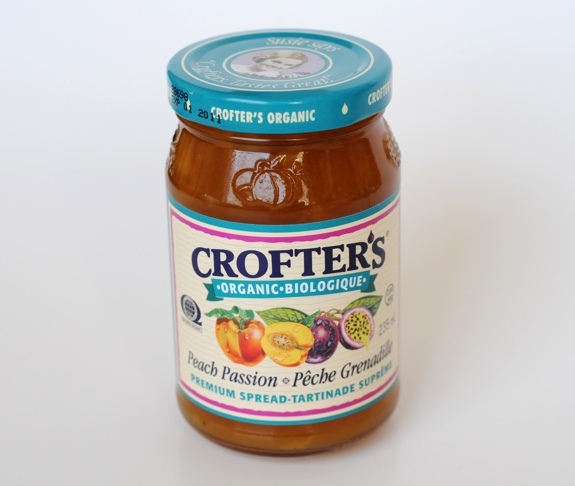 Thing is, Crofter’s Peach Passion Premium Spread tastes far more like peach than passion. Up front, there’s lots of peach, followed by notes of passion fruit that gradually emerge in the finish. The lingering aftertaste is floral passion fruit, which is nice. If you’re spreading it on toast made from a loaf with more flavour than Wonderbread, the passion fruit is going to get lost in all the other tastes. Which is a shame, because passion fruit has such a strong, distinctive flavour. That’s not to say it isn’t a very good jam. It is. But I would have preferred a bit more passion to balance out the peach. My wife agrees, both in terms of the lack of passion fruit, and the overall goodness of the jam. “I’m not a huge, ginormous fan of jam, but I love this one,” she said, licking her lips. I’d be happy to try some of the other Crofter’s jams when I get the chance. 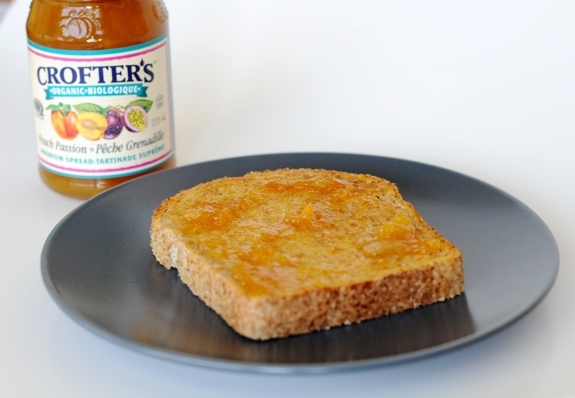 Crofter’s Organic Peach Passion jam, as applied to a piece of toast. Cost: About $4 to $5 for a 235 ml jar. Value for cash money: Not bad for an organic jam. Availability: Better grocery stores, organic shops, etc. Nutrition? : 35 calories per tablespoon. Not super sweet. Organic fruit and cane sugar. Just fine for a jam. The verdict: Not bad, but needs more passion-fruit flavour to be a true peach-passion jam.